If you live in, or plan to be in the New York area, it's all here courtesy of New York Magazine with everything from the best cork-popping bashes to the best spots for hangover brunches well after daybreak on January 1. And with this, I'll wrap things up here for the year 2006. Have a blast whichever way you decide to spend the evening, including a little bit of "the hair of the dog" if you're so inclined the following morning. Let each and every one of us also try to make the year 2007 the best one of the new millennium -- to date. Additionally, as well as most importantly, let us all try to keep our fearless U.S. soldiers stationed in various outposts overseas close to our hearts and *always* in our thoughts. Here's hoping to see more of these brave men and women COMING HOME to their families and loved ones soon. A HAPPY AND A HEALTHY 2007, everybody! I've got to hand it to my good friend Ivette Ricco and the inimitable Femmefan website for giving me my biggest holiday chuckle -- to date. Needless to say, I totally love this site, and the gracious lady who runs it (yes... I've also contributed an article or two there in the past). So given that there's bound to be a "sports fan" in all of us -- even though perhaps some of us don’t always care to admit it (really, you'd be surpised at...well, never mind), I highly recommend this latest issue filled with the usual contributed "tailgater" recipes on the Food Bowl page, and lots of other holiday stuff. You can also check out the rest of her "Chest-nuts" poem here. Have A Holly, Jolly Christmas, One And All! The long-shuttered and graffiti-ridden Childs Restaurant in Coney Island, Brooklyn could soon be re-opening as a seaside food court or upscale restaurant, according to a recent article in the NY Daily News. Childs Restaurant, which opened the first of its nine cafeteria-style diners in 1898, extended to Coney Island in 1922 and included rooftop dancing. At one time, they were also a familiar sight and very much part of the overall fabric further north in Manhattan, along with their great meals and affordable prices. So for all you nostalgic New Yorkers like me, who remember this great restaurant chain, and possibly what you were up to in those glorious yesterday years of Coney Island, the original Nathan's Famous eatery, the super-fantastic Steeplechase Amusements, etc., paste on your best smiley face of the day -- and read more here. Yes, yes…I'm back here again, with yet *another* holiday gift idea (hey, what can I say, I heart Christmas, and yes, it often shows). 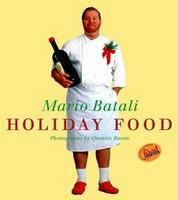 Super chef Mario Batali's Holiday Food , although a bit on the slender side as far as conventional cookbooks go (approx 145 pages in all), presents typical Italian dishes that are served for Christmas and New Year's. A rich, compilation of authentic Italian foods made by an Italian-American chef, needless to say, this one is my pick for the best stocking-stuffer item for all the consummate "foodies" on your gift list. Also thrown in, is a pretty fair shot of Chef Batali's signature orange "clog" footwear -- for good measure, of course. I'm willing to collect more of these things. Why? I don't like stamps. 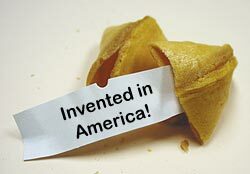 A collector of anecdotes for fortune cookies that are odd, unusual, or just plain bizarre, the Weird Fortune Cookie website is one of the most cleverly "entertaining" sites I've visited in a while. 1. Go get a dictionary and look up the word irony. 2. Mark the page so you won't lose it in the next step. 3. Beat yourself over the head with the dictionary and repeat the phrase "I am unfit to live without supervision" 300 times. Now leave my site at once. 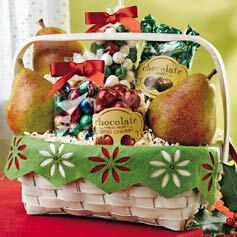 With Harry & David being one of my favorite catalogues and all-round venues for holiday baskets (Godiva chocolate lover that I am, I have to say their line of assorted chocolates is just as outstanding for gift-giving too! ), I was happy to see that they were also mentioned among a few other quality vendors in this month's Food & Wine magazine that features 12 Incredible Edible Holiday Gifts. As indicated, these are all gifts that many true food lovers dream of receiving, from fresh truffles, to artisanal olive oil, fruit baskets, gingersnaps, and the list goes on. So check out the link above for some exceptional "foodie" gifts for all those on your holiday list who'll appreciate it.